I slide three shiny red jelly beans together. Trumpet blast. I put three lemon drops in a line. A xylophone sounds a jingle of approval. Then I get five purple jujubes in a row, and they snap into a single, multicolored, disco-ball-looking nonpareil equipped with deadly lasers. An authoritative baritone tells me that I'm "tasty," or better yet, "divine," and the squares of clear jelly I've been tasked with removing disappear with a satisfying pop — satisfying, that is, until, tantalizingly close to my goal, I run out of moves and lose the game, causing a little puppet girl with paper-fastener arms to cry. This game is stupid, I think. There's no skill, no challenge. Then, like a lab rat pawing a pellet lever, I hit "Retry" again. And again. Soon, I've lost another 45 irretrievable minutes of my life to "Candy Crush Saga." "It's a good thing they didn't ask you to write an article on heroin," a girlfriend cracks. She understands. Her "Candy Crush Saga" addiction is much further along than mine — she's on the higher levels where you have to clear chocolate. As addicts, we're in good company. King.com's "Candy Crush Saga" is ranked the top-most downloaded mobile game. AppData reports that "Candy Crush" has 14.7 million daily active users, compared with 6.5 million for Zynga's FarmVille 2 and 5.3 million for Social Point's Dragon City. The next most popular nongame app is Spotify, with 13.4 million daily users. 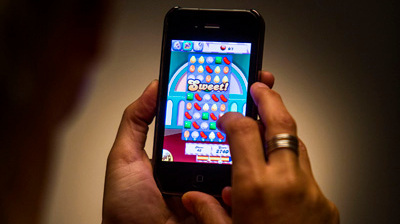 Designed to appeal primarily to "casual gamers" (read: women), "Candy Crush Saga" is what developer King.com's "games guru" Tommy Palm terms a "snackable" game — one that can be played in short bursts, in line at the grocery store, at your desk when the boss isn?t looking, in stop-and-go traffic. And the low buy-in threshold ? the game is free and takes only seconds to learn — means that people who wouldn't dream of, say, putting in the hours it takes to amass "World of Warcraft" gold, can get roped in easily, and the snack soon becomes a 27-course meal full of empty yet inexplicably compelling calories. The game is so simple it borders on banal — game play is something like those cheap plastic slider puzzles that come in party favor bags, where you slide the pieces into order. But once King.com added flashing motion, multiple levels, sound effects, music and saturated Candyland-like hues to the party favor, it became a sensation. The game is so compelling that in the 12 months since the Web-based ?Candy Crush? was released as the cross-platform ?Candy Crush Saga,? playable on tablets and smartphones and spreadable via social networking, it has become a smash hit. And in a field crowded with a staggering 15,000 competitors on iPhone alone, that?s an impressive feat. London-based King.com has released previous iterations of ?match three? games before, such as ?Bejeweled Blitz? and ?Bubble Witch Saga,? but it was the combination of ?Candy Crush?s? signature look, sounds and, most importantly, power-ups that allow players to combine enhanced candies into supercandies (like the disco ball) that unleashed ?Candy Crush?s? sugarnaut. The word ?addictive? is often used to describe the user experience of games, but isn?t really accurate in the clinical sense, says Ofir Turel, professor of Information Systems and Decision Sciences at Cal State Fullerton. ?It is possible that some people have weak self-regulatory abilities, or their resources are invested in other tasks ? e.g., trying to deal with negative emotions ? and they consequently find it difficult to inhibit urges in general, and possibly also regarding such games.? But for the vast majority of people, Turel says, games are simply a form of escapism. They also satisfy the need to gain a sense of mastery of tasks, a feeling of status or the need to belong ? thus the importance of ?Candy Crush?s? social networking aspect. Tadhg Kelly, a columnist for Tech Crunch and creative director at Seattle?s Jawfish Games, says the game?s appeal comes from revolving around activities that are inherently pleasing to the mind. ?The ?Candy Crush? style is largely based around ?I need to clean and I need to keep things sorted and in order.? It?s not different from ?Tetris? ? it?s all about forming order out of disorder. There?s a great game called ?Diner Dash,? which is the same thing ? you?re a waitress in a restaurant, in a chaotic situation ? you?re trying to get customers served, clear plates, collect money, back and forth, with the objective of having a clean restaurant. That?s a very strongly rewarding activity.? That?s how the game tricks users into basking in a feeling of accomplishment, even as the nonvirtual dishes remain unwashed. A cartoon making the social media rounds illustrates the phenomenon: a woman, her gaze fixed on a computer screen, says, ?Sorry, kids, dinner?s gonna be a little late tonight ? Mama?s got five lives left and this candy ain?t gonna crush itself.? ?Candy Crush Saga? is what?s known as a ?freemium? game ? it?s free to download and play, but players can buy special tools like the Lollipop Hammer or buy additional lives, preventing frustrating lockout delays that leave you with nothing to do but attend to your personal hygiene or interact with your loved ones. But Palm says, with a note of pride, that ?Candy Crush? was specifically designed so that it is possible to complete all of the levels without spending a dime. But of course, the experience will be a brisker one if you pay, and King.com encourages this by blocking players from moving on for intervals of, say, 21 minutes. An anthropomorphized heart sheds tears when you?ve run out of lives, but also reminds you that you can buy more for $0.99. L.A. screenwriter and longtime gamer Eric Trueheart, however, argues that the freemium model is ruining gaming by putting game designers? attentions to the wrong tasks. ?Game design used to be about creating fun. Now it?s about creating frustration. Once upon a time, what people tried to do was design a game experience that would be fun and engaging all the way through. Now what they do is try to make a game that may be engaging for the first 30 minutes, then deliberately throw things in there that will slow the game down or make it frustrating unless you come up with that extra money.? Kelly notes that some game design firms have even gotten into ?ethically strange territory? by targeting such games to children. In fact, the U.K.?s Office of Fair Trading, in response to complaints from parents that kids have racked up bills in the thousands of dollars while playing ?free? games online, is investigating whether children are being unfairly encouraged to pay for freemium games. The primary hooks in ?Candy Crush,? however, are the exciting moments when you catch up to a fellow Facebook friend, when you earn an especially destructive candy-crushing tool, or when you clear a level, triggering a thrilling cascade of sugary explosions. Palm says that ?Candy Crush Saga?s? popularity is largely because of the game?s success at hitting the sweet spot that properly balances skill and luck, and Kelly agrees. ?That sort of semi-predictability is very, very important,? he says. ?You can compare video games to sport in that respect ? where you know the rules, you know the basics, but at the same time, all sorts of things can happen. There?s a weird middle ground between where it?s completely luck and completely skill that players seem to really, really like.? Once the anticipation of a reward is gone, however, when it becomes obvious in the middle of a game that you don?t have enough moves left to clear the board no matter how lucky you get, the game quickly becomes drudgery. I?ve experienced this tedium enough times now that I?ve decided, finally, I?m going to uninstall the game from my phone. That is, after I clear just one more level.